﻿[MOD] Rise of Lu Bu 3.0 – Downloadable! [MOD] Rise of Lu Bu 3.0 – Downloadable! Home › Forums › Destiny of an Emperor › [MOD] Rise of Lu Bu 3.0 – Downloadable! This topic contains 534 replies, has 19 voices, and was last updated by Meng Da 2 years, 5 months ago. 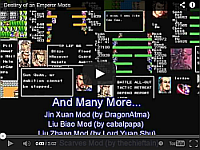 In the Cao Cao mod, James actually knows how to modify level system to get your army past 60.000 soldiers. See the post that starts with "I've looked over the level up formulas…"
I would guess that you do this by repeating the level up event in the text but I haven't tested it. Perhaps you would be kind enough to patch the latest upload of the game (at the top of the page) with the TP update from 3-5 to 4-6? I'll show you how to do it as you will need to make a lot more hex edits. Do you have your hex editor? If so, open the rom with a hex editor then scroll down until you get to the line 3B660. Then starting at the 7th entry you should see this pattern: 03 04 05 03 04 05 04 05 04 05 04 05 04 05 04 04. Then just bump up each number by 1 and you are good. it goes down to 3b6f maybe im looking in the wrong spot. Line or address? it goes to 3b657 when i search for an address. And ive got a bunch of strange symbols in the right side box. Don't worry about the right side box. On the left side do you see this pattern? 03 04 05 03 04 05 04 05 04 05 04 05 04 05 04 04. In fact, if you search for that pattern it should take you to the 3B660 line. okay, so lets see if ive learned hex fast enough.. Think im starting to get it. Do you know if there is any info on merchant shops and where in the hex are the values to change what they sell in each city? and a list of hex values for items? FF "I found a small keyhole." I'll find prices in a little while. I think I remember how to find it. Aren't prices right before the item names in the ROM? Little-endian, starting at 2FAF0? It's two bytes before each name. If you want to see the base price, flip the bits and enter them into calc in hexadecimal mode, then convert to decimal. Smoke Pot, for example, is at 2FBAA and has a price of C8 00 -> 00 C8 -> 200. You can change the price pretty easily, just reverse the process. To halve the price, 100 in hex is 64 so 00 64 -> 64 00 to replace C8 00. It'll be really easy to find them if you have the table loaded. EDIT: You beat me to it Niahak. I was busy making my post when you wrote. 1. Open your ROM in a Hex Editor where you can load tables. 2. Load the doaetable.tbl from Destiny of an Editor. 3. Now in that right side box you were ignoring before you can now see some English words. If you look down from 2FAF0 to 2FD40 you can see item names. If you highlight the item name right before it is 2 entries that have the price. For example right before "Dagger" I see "32 00". Note that these numbers are backwards. Ie… The price would be 0032 in hex, not 3200. As for max price, the highest hex value is F. So the super max price would be FFFF. Converting that to Dec I get 65,535. That is the maximum price in the game. To get a price any higher would require assembly skills beyond mine. okay, gonna see what I can do. Updated the mod w/ a number of changes.